In the 2K Empire Classic at The Garden Thursday night, UConn beat 15th-ranked Syracuse, 83-76, in a rekindling of their old Big East rivalry, while Iowa beat Oregon, 77-69. On Friday afternoon, Oregon will face Syracuse in the consolation game at 4:30 p.m., while UConn takes on Oregon in the championship game at 7:00. UConn was led by Jalen Adams and Alterique Gilbert, who had 16 points each. Adams shot 5-12 overall and 2-6 from behind the arc, with 8 rebounds and 4 assists. Gilbert shot 5-10 overall and 4-5 on threes, with 8 assists and 6 rebounds. Off the bench, Tarin Smith had 14 points (5-8 FG), 6 assists, and a rebound, while Eric Cobb had a double-double with 13 points (6-10 FG, 1-1 threes) and 13 rebounds, with an assist. Christian Vital had 11 points (4-6 FG, 3-3 on threes), with 2 assists and a rebound. Syracuse was led by Jalen Carey, who had 26 points on 9-14 from the field and 1-4 on threes, with 7 rebounds, but he committed 6 turnovers. Tyus Battle had 16 points (7-17 FG, 1-5 threes), with 4 assists and 3 rebounds, while Elijah Hughes had 15 points (5-14 FG, 3-8 threes), with 2 rebounds and an assist. UConn came out firing in this one, as they jumped out to a 13-4 lead capped by a Christian Vital layup at the 15:31 mark of the first half. Syracuse responded with a 13-4 run of their own to tie it at 17 on a pair of free throws from Paschal Chukwu. UConn took a 32-25 lead on a three-pointer from Eric Cobb with 4:09 left in the first, and they took a 38-32 lead into halftime. In the second half, Syracuse cut UConn's lead to two, 41-39, on a Jalen Carey layup at the 17:10 mark. UConn responded with a 13-2 run capped by a three-pointer from Tyler Polley that made it 54-41 with 13:22 left. 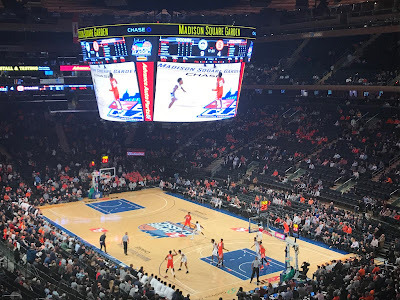 Syracuse pulled within five, 66-61, on a three-pointer from Elijah Hughes, with 5:25 left, but UConn opened up a 10-point edge, 76-66, with 1:39 left on a Jalen Adams three, and that would prove too much to overcome. UConn Head Coach Dan Hurley, who is in his first year at the helm, said he was "obviously thrilled with" his first big win. "Anytime you get a chance to play a rivalry game in The Garden, just obviously an excellent atmosphere to play in and these guys really raised their games. They got a look the last couple of days and they couldn't wait to get here and play. They went out and performed at such a high level. (Alterique Gilbert and Jalen Adams), they looked like two of the better guards in the country out there, big play after big play. Eric (Cobb), 13 and 13 off the bench was huge. We got huge contributions across the board. We really guarded them and these guys got what they deserved: a great moment in The Garden." Hurley said of what impressed him most about his team, "Just how far they've come in such a short amount of time. It's been like six or seven months together. It's been six or seven hard months. We've been getting after it pretty good. These guys have bought all the way in. Just coming into a game like this, the first kind of big game against that type of zone defense early in the season, to see such a difficult thing to play against and the way these guys stepped up, made big shots, competed, defended, kept them under 40 percent from three, pressured them early, guarded the three-point when they needed to, out-rebounded them. Just a great effort by these guys." Jalen Adams said of how much of the team's intensity is a byproduct of having Hurley as their coach, "I think pretty much all of it and then the other half just comes from what we've all been through. Just over the couple of years we've all been together with injuries and just on the court, not winning games, not putting away games. It just all comes from that. When you get a chance to play against a top 25 team (Syracuse is ranked #15) and get to prove a lot of people wrong, there's nothing better than that. So once we got out on the court in this great arena, I don't know, the energy was just there for me right out of the gate." Syracuse Head Coach Jim Boeheim said of the game, "In the second half we did a little better on both ends but not good. Defensively, we didn't do a good job inside...They made some long threes in the second half and that was probably the difference in the game. We weren't in any way, shape, or form good on the offensive end. We did a little too much one-on-one stuff and didn't finish around the basket. I think the one thing that came out of this was Jalen (Carey) played with a lot of poise, played a tremendous game. But, the guys that we count on to score did not play well tonight."